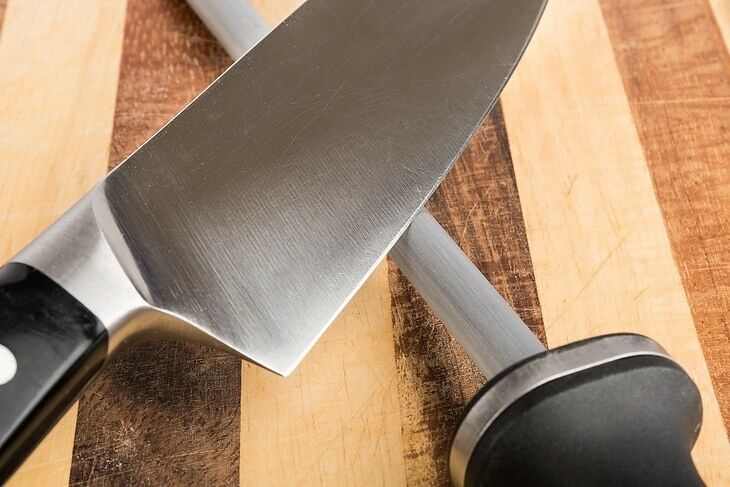 A chef's tools are critical in the kitchen, and choosing the best utility knife for any job can help improve the chef's versatility and recipe range. For many beginning cooks, however, it can be difficult to figure out which knife can provide them with the right edge to improve their cooking skills. By learning more about different types of utility knives, you can be better equipped to make a more informed purchase. Keep your eyes open for desirable qualities in a good utility knife, and be sure to budget accordingly to buy a good knife for your short- and long-term needs in the kitchen. A utility knife is an entry-level knife that can make an excellent purchase for any beginning chef because of its versatility. All-purpose utility knives are usually smaller than specialized knives as they are only between 5 and 7 inches long. These knives are often included in knife sets, but consumers can also purchase them individually to become more familiar with them. My first utility knife was a Zyliss beauty, and it was invaluable when I just started learning my way around a kitchen. Though ultimately there are specific knives for specific tasks, a utility knife is a perfect way for beginers to become familiar with the basics in the kitchen. Utility knives, as the name implies, are designed to be useful in just about every kitchen situation. Because they are smaller, they can be easier to store and keep around for quick convenience. They retain their edge well, making them perfectly suited for slicing fruits, onions, garlics and vegetables. The knife can even be used to slice meat and roots although regular use can wear down on the material as the blade is often not built to stand up to such heavy tasks. Ultimately, if you're anything like me, you want a knife that you can keep handy no matter what meal you are preparing. 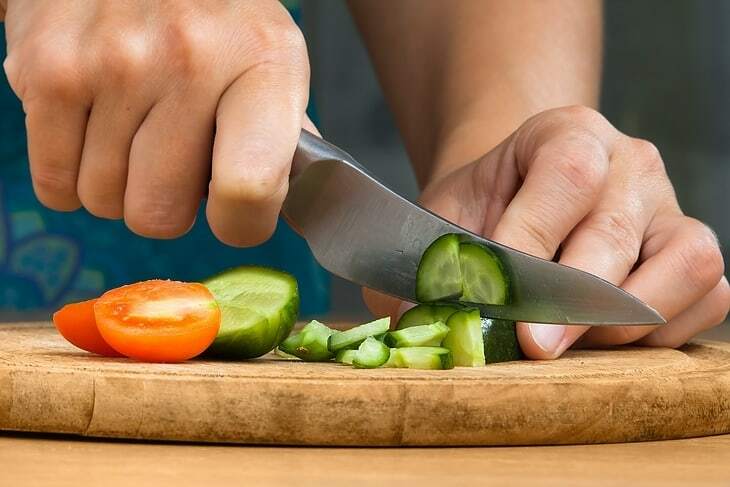 A chef's knife can chop larger vegetables, and a carving knife can help you get that perfect slice of roast beef, but you'll always return to your utility knife because of how comfortable and convenient it is. When you're ready to begin shopping, consider some of the following qualities that you want in a good utility knife. Set up a budget if you are not interested in spending too much, but remember that just like any other knife, a sturdy and well-maintained utility knife can last you a lifetime. One of the most important aspects of choosing a good utility knife is deciding on a blade material and determining whether it is of sufficient quality. There are many different primary materials used for blades, ranging from common choices like aluminum and stainless steel to more luxurious options such as obsidian and ceramic. Though the latter choices are often more expensive, stainless steel remains a classic option, especially for beginners. Look for a high-carbon stainless steel knife as these are less likely to break and typically retain their edge for longer. All knives naturally lose their edge over time, so be sure to invest in a quality sharpener too. A good handle often determines whether the knife will last as long as you want it to. Some of the most distinguished knives feature handles made from materials such as high-density wood and tough resins, and cheaper knives often have handles made with faulty plastics and softer woods. Avoid cheaper handles as they break more frequently, resulting in damage to your knife or your hand. 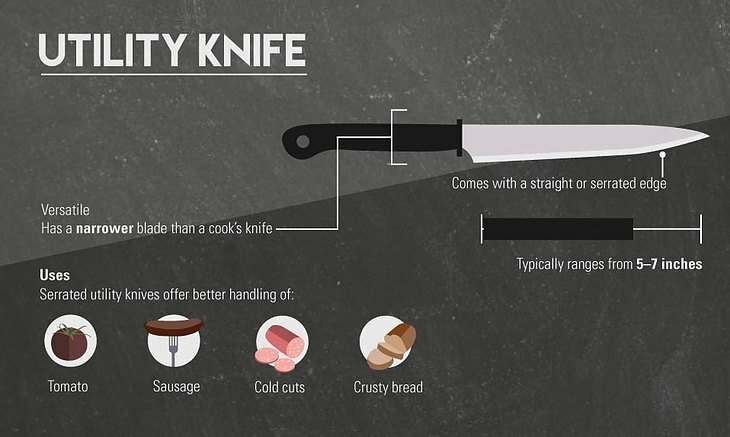 Ideally, the knife should be made out of one single, solid piece of metal, so be sure to inspect the handle to see if the knife extends downward past the blade. Utility knives often come in two blade varieties: straight and serrated. The advantages of each depend largely on the type of cutting you plan on doing, but investing in both can be a good way to cover all your bases. My first knife had a straight edge, although some serrated edges are ideal because of their strength. A serrated edge is able to cut through denser foods without damaging the slice itself, making it suitable for meats and bread. On the other hand, a straight edge is perfect for more sensitive cuts, such as tomatoes and cheese. Therefore, choose the edge based on the types of meals you prepare most often. Because you are going to be using the knife regularly, it is critical for you to choose one that you are comfortable with. Though all utility knives are built around the same size, different materials contribute to different types of balance and weight. Choose a utility knife's weight according to what you are comfortable with, but always strive for a balanced tool. A balanced knife will require you to spend less energy on every cut because the center of mass is carefully calibrated to rest comfortably in your hand. Though it may seem like a relatively small factor, I promise that you will notice a major difference between a well-balanced knife and a poorly balanced one. This utility knife is the result of decades of traditional craftsmanship. It is capable of not only holding its edge but also resisting all types of damage thanks to its superior construction and metal quality. The knife features a Japanese multi-layer steel line that is designed to provide users with the construction they need to stay on top of their cooking in an active kitchen. The blade measures 5 inches and showcases a beautiful Damascus-style surface, making the knife as much of a decorative tool as a functional one. The knife is also dishwasher safe, so it is perfect for busy households. 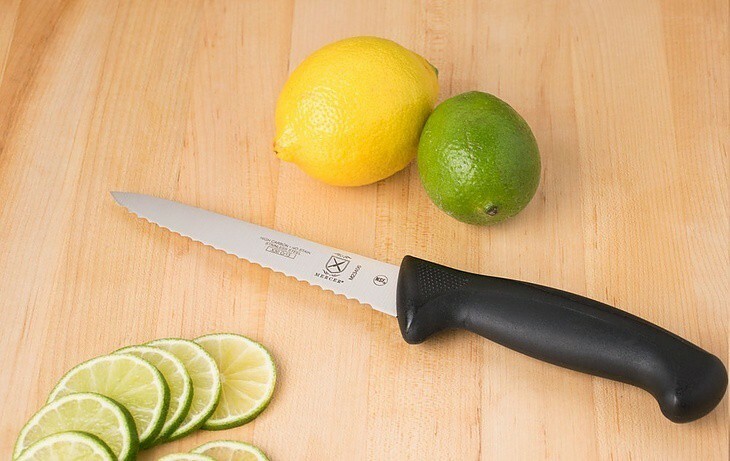 A durable blade that can cut through all kinds of food without losing edge. The blade's core is made from an ultra-hard steel system. Shaped to improve cutting abilities, ideal for dicing, chopping and other types of intensive slicing. Stainless steel surface resists corrosion whether by exposure to chemicals or through the process of weathering. A beautifully polished and darkened handle matches the decorative blade's surface. The knife is on the more expensive side. The thin blade may seem difficult to wield for beginners. This brand's knives are renowned for their laser-controlled edges, featuring durable metals in the construction to provide users with a longer-lasting knife. The knife itself is made from a single piece of high-carbon steel, carefully shaped into the desirable form to reduce weaknesses and faults. The handles are made from a polymer resin, and you can see the several rivets that keep the blade anchored to the handle itself, reducing the risk of long-term damage. The knife is 6 inches long and designed for convenience in a busy kitchen. It features a straight edge that does not require any additional care to sharpen. The knife is finely built through a specialized forging process before laser sharpening for a more precise and honed edge. The blade is sharp enough to cut through soft and hard foods without causing any discomfort in the user's hand. It's a perfect entry-level knife as it is both affordable and carefully balanced to suit an inexperienced user. The reliable material is capable of resisting all types of damage and lasting as long as needed. The blade is on the longer end of utility knives, which makes it more difficult to store and maintain. Recommended to be washed by hand, which may be difficult for those with busy lifestyles. This serrated utility knife is 5.5 inches long. It is made from durable high-carbon stainless steel, and it is intended for regular use, evident in its attractive construction and presentation. 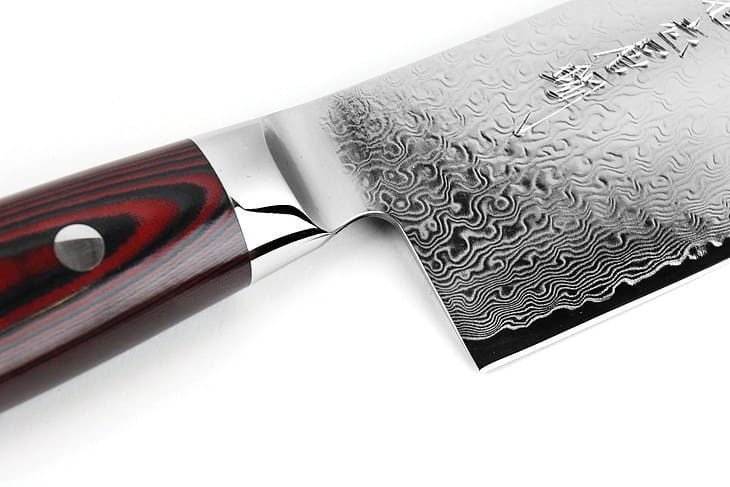 The blade is non-stick, and it features an exquisite Damascus pattern upon its surface that is reminiscent of flowing water or wood grain. The rounded handle eases your grip, and the knife itself is carefully balanced to provide you with the heft you need to cut through your food quickly and easily. Though not intended to be an entry-level utility knife, it can be a perfect addition to any cook's arsenal once they are comfortable with the tool. The highly durable and specialized material is capable of resisting all types of damage. The finely honed blade is designed to handle both delicate and tough foods. The blade minimizes unnecessary edges and rough points for an easy-to-use knife. 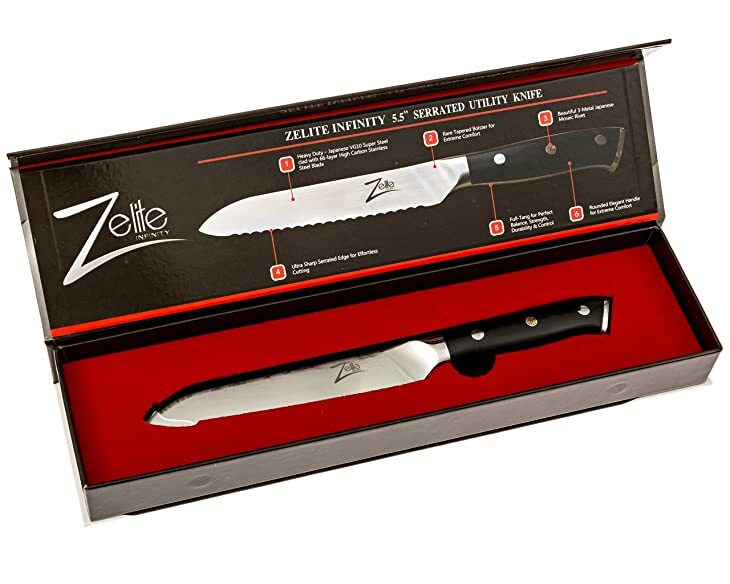 The knife comes with a premium packaging case for storage. This utility knife is a bit pricey, especially for a beginner. The cutting edge is on the thicker side, making it difficult to wield for the inexperienced user. An elegant ceramic answer to stainless steel variants, this utility knife can make a fine addition to any modern kitchen. The blade is made of a dense ceramic surface that is carefully crafted to resist all types of wear while providing users with a very sharp edge. Because of the unique physical and chemical composition of the knife, it is able to resist corrosion and rust, and the ceramic material reduces damage to the knife itself, which means that it can retain its shape for longer. The singular composition typically means that the blade will not break off during preparation work like cheaper metal knives would. Lacks metal in the primary construction, the knife will never rust or corrode. 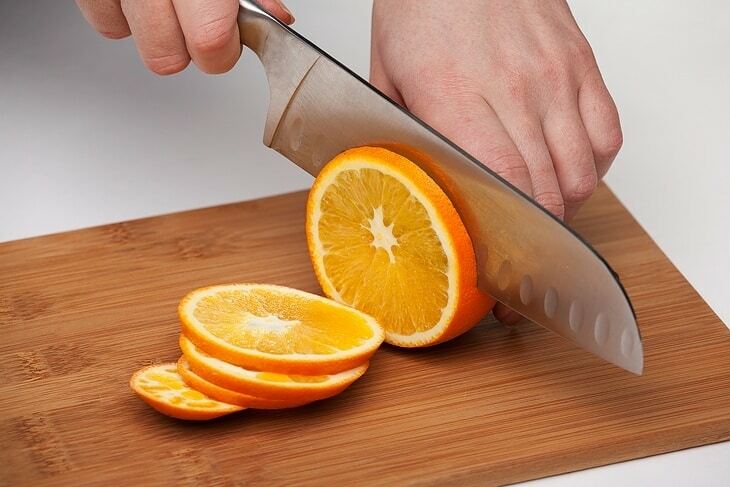 It can safely be used for more acidic fruits and vegetables as the juices will not corrode or damage the knife's edge. The knife naturally resists weathering no matter where it is stored. An elegantly crafted handle is designed to improve the user's grip without sacrificing much in terms of ergonomic construction. It does not resist impact damage well. May chip or break entirely if it is dropped on a hard surface. The knife is relatively plain in its design. Sometimes, simplicity is the answer for cooks just learning about utility knives. This handcrafted knife is bare bones in its presentation, but it's more than capable of providing you with the comfortable grip and sharp edge you need to be a success in the kitchen. The high-carbon stainless steel blade is well sharpened to reduce resistance. It is powerful enough to cut through roots and radishes and gentle enough to slice through delicate foods without making a mess. The aluminum handle is carefully balanced to provide you with an additional degree of control, and the knife itself is dishwasher safe and easy to maintain over the course of its life. The durable stainless steel surface resists weathering damage from water and acidic foods. The comfortable handles are designed to rest snugly in a user's hands, preventing slips and other handling issues. The blade is sharpened particularly well to suit beginners and can be sharpened with inexpensive tools. The knife blade and handle feature a very simple, plain design. The knife needs to be washed and dried immediately, or the handle may become discolored. The 4 3/4-inch blade is on the shorter end of utility knives. For style, comfort and raw cutting power, The﻿ Yaxell ﻿Super ﻿Gou Utility Knife is the perfect purchase for any discerning chef. Though it may have a steep price tag, there are few other knives that can compare in terms of quality and comfort. The knife does not feel unnecessarily heavy or imbalanced. Both affordable and carefully balanced to suit an inexperienced user. With high marks in all categories, I strongly recommended this blade when you are shopping for a new utility knife. If you found this information useful, be sure to share it with another home chef you know! Ask any questions you may have in the comments below, and happy cooking! If you are in need of finding some knives to slice large meat such as turkey or regularly have to fillet fishes, an electric knife is exactly what you need. Learn more about electric knives at Best Electric Knife For Your Kitchen﻿ to pick a right one for you.